LOCATION! LOCATION! LOCATION! THIS 3+ BEDROOM, 2 BATH HOME IS CENTRALLY LOCATED AND CLOSE TO SCHOOLS. BEAUTIFULLY UPDATED KITCHEN WITH ALL THE "EXTRAS", INCLUDING PULL OUT AND SOFT CLOSE DRAWERS, KITCHEN PANTRY, GARBAGE DISPOSAL, AND MORE. STAMPED CONCRETE PATIO OFF THE KITCHEN FOR EASY GRILLING ON THOSE SUMMER NIGHTS. 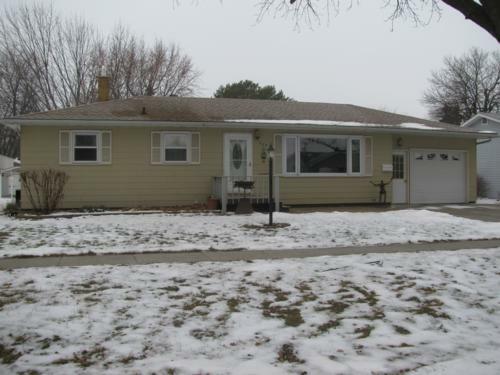 THIS HOME HAS A SPACIOUS LIVING ROOM WITH LARGE FRONT WINDOW THAT OVERLOOKS A STAMPED CONCRETE PATIO. HARDWOOD FLOORING IN TWO OF THE 3 BEDROOMS, DEEP WHIRLPOOL TUB, A FULL FINISHED BASEMENT COMPLETE WITH AN OVER-SIZED LAUNDRY ROOM. STAMPED CONCRETE PATIOS IN FRONT AND BACK OF HOME. THIS PROPERTY HAS A SINGLE ATTACHED GARAGE, A DOUBLE DETACHED GARAGE, GARDEN SHED AND PLENTY OF PARKING!! VERY EASY TO HEAT AND COOL!! CALL TODAY FOR YOUR OWN PRIVATE SHOWING!! SLATE SIDING, NEWER SHINGLES, STAMPED CONCRETE PATIOS, LARGE BACKYARD AND GARDEN SHED. 1 STALL ATTACHED GARAGE AND A 2 STALL DETACHED GARAGE.